Mike Eaton presents 9 cards from Khans of Tarkir, Magic: The Gatherings latest set, and the deck-building ideas they inspired. The simplest way to play Magic these days is to play on Friday Night at your Local Gaming Store, but there are plenty of other options for these new cards from Khans. My main concern, for example, is which cards will fit into my Magic cube -- which you can think of as a self-contained Magic deckbuilding game. Still, most folks are hungry for that next great standalone deck. Your personal taste may vary, but I hope you find at least a few cards in these nine (OK, more like seven or eight, and you’ll see why) as a starting point for your new favorite deck. 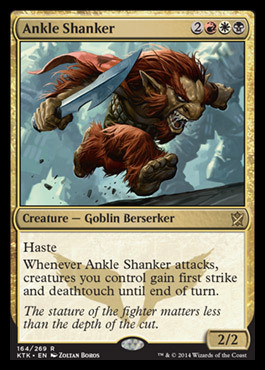 The Shanker is a Mardu (Red-White-Black) goblin creature that, when it attacks, gives all your creatures two abilities: First Strike and Deathtouch. 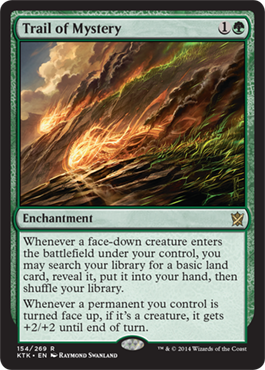 That means they a) deal damage before your opponents’ creatures deal it back (usually) and b) immediately kill any creature they damage. The result? No retaliation! Attack with all your might and see who dares block you! Best Paired With: Any creatures you would like to attack with every time. These two cards are one entry because, while both do good things on their own (a 3/3 Double Strike creature and a card that gives +6/+6), the combination is really where they shine. 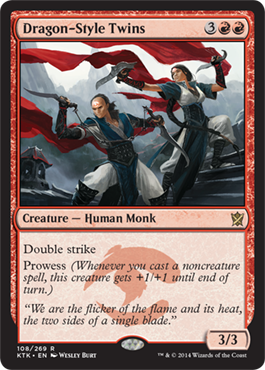 The Twins also have an ability called Prowess, which means they get +1/+1 for each noncreature spell you cast. If you let them Become Immense, they turn into a 10/10 creature. With Double Strike, they’ll deal 10 damage during the First Strike step and 10 more during regular damage; that’s . . . (carry the 4, use some Common Core, x=3.14 . . .) twenty damage in one attack! Best Paired With: Each-other, other Double Strikers (like Hound of Griselbrand), and other huge pump spells (like Might of Oaks). Confession time: I just kind of adore Narset. She’s a master monk and leader of the Jeskai (Blue-White-Red) clan; what’s not to love? 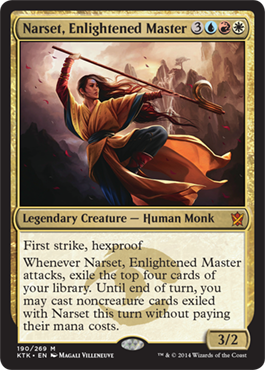 In game terms, Narset has Hexproof and First Strike, meaning that she’s hard to get rid of by blowing her up or blocking her. She also has a super cool ability: when she attacks, you can basically play the top four cards of your library for free (as long as they aren’t Lands or Creatures). 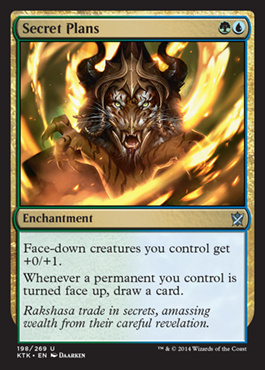 As soon as humanly possible, I’m going to build a Commander deck with Narset at the helm, and I’ll fill it with every Enchantment and Equipment card I’ve ever wanted to put onto a creature. Then I'll put Narset’s enlightened abilities to good use. Who doesn’t love a good tiger demon? The Rakshasas of Tarkir are crafty magic hoarders, and they are loyal to the Sultai (Black-Blue-Green) clan - or vice versa, I suppose. This vizier gets bigger when cards get exiled from your graveyard. It sounds difficult until you remember that this set uses the Delve ability, which lets you do just that to cast certain spells. If you build carefully, you might find it’s not too hard to fill your graveyard up with cards, and use them for added value -- both for the Delve spells you cast (like maybe Treasure Cruise) and for your vizier. Rattleclaw Mystic is a bit different from the rest of our list. The best thing about Rattleclaw is that you can use it to cast anything *else* you might want. 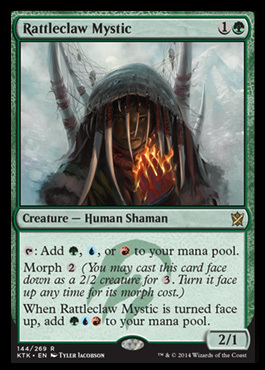 Especially in the Standard format, where you have access to Elvish Mystic and Sylvan Caryatid, too, Rattleclaw can help you power out your favorite high-cost spells far earlier than nature intended. Of all the cards on this list, Rattleclaw is probably the most “competitive” and practical for the Standard events at your Local Gaming Store. Best Paired With: Huge, scary Standard-legal creatures, like Scuttling Doom Engine, or any of the Souls from Magic 2015, like Soul of Shandalar. 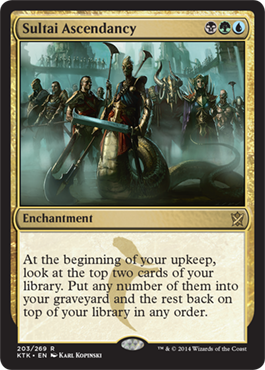 The Sultai are back already - because this enchantment is a powerhouse. It lets you look at the top two cards of your deck every turn and dump them into your graveyard if you like. Doesn’t sound powerful yet? How about if you think of it as drawing three cards per turn -- especially in a world where you can use those pitched cards to Delve? Find exactly what you want and use the rest for extra tricks. That sounds like a deck waiting to happen. 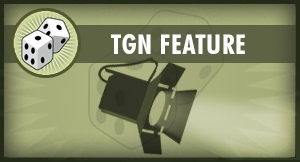 Best Paired With: Your favorite combo -- ideally one that uses the graveyard as a resource. Many of us have old Morph creatures lying around from other sets. Morph is the classic, tricky ability that lets us play a creature face-down and flip it up at any time to reveal its secrets. Trail of Mystery and Secret Plans make the prospect more attractive. With these cards out, you can search your deck for lands or draw extra cards, among other special effects, no matter which creatures you use. The abilities of your favorite Morphers (mine are Exalted Angel and Fortune Thief) are just icing on the cake! And, if you have any favorite cards from Khans of Tarkir that inspired a brand-new deck, let us know!